This lesson describes how to create a Rollover IEP from the Previous IEP. Rolling over an IEP will allow you to incorporate information from the previous IEP.. This lesson requires that you have selected a student and are viewing a single student's record. If you are unsure how to locate a student, refer to the "Find a Student" lesson in the "Students" manual for help. 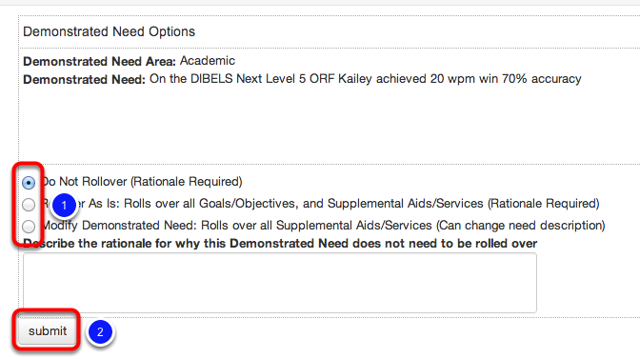 To create an Invitation click on Special Ed-> IEP Details-> Click "Select Action" Dropdown-> Click "Rollover"
1. Note the areas of the previous IEP that are automatically rolled over, if they were completed. 2. Optional Areas to Rollover, click on the desired link to rollover information from Student Strengths or Demonstrated Needs. The Student Strengths that were entered in the previous IEP will appear under the IEP Wizard Rollover Student Strengths page. Place a checkmark in the appropriate box or boxes by clicking the box. Click on Rollover Checked Strengths. 1. The Demonstrated Needs from the previous IEP will rollover into the IEP Wizard Rollover Demonstrated Needs page, select the appropriate choice by clicking on the radio button next to the desired option. Note: You will need to address each Demonstrated Need Area as to Do Not Rollover, Rollover As Is, or Modify Demonstrated Need. The IEP Details page now displays your Rollover IEP (Review). From here on out, the process for completing a Rollover IEP is the same as creating any other type of IEP in Illuminate. For more information on continuing in the IEP process please refer to the Create An Invitation Lesson in the Complete an Eligible IEP Manual.